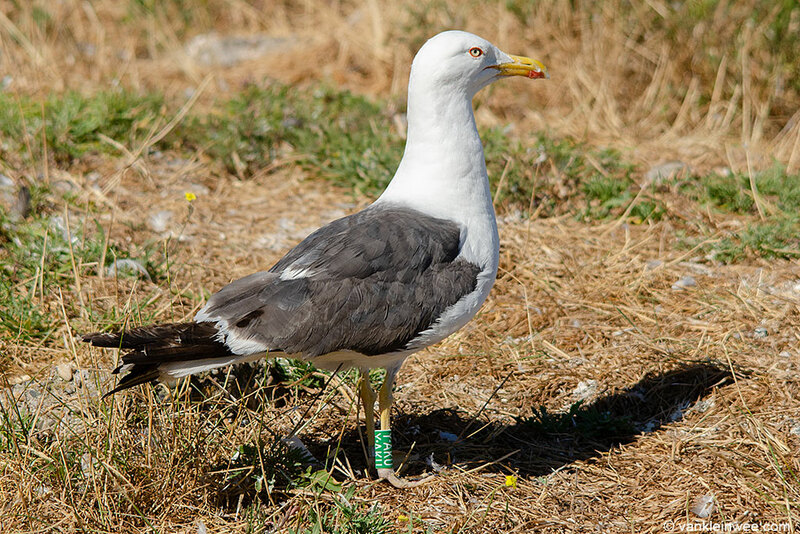 When determining the age of a gull, we use the presence or absence of dark markings at specific areas in the plumage and on the bill to distinguish sub-adults from adults. 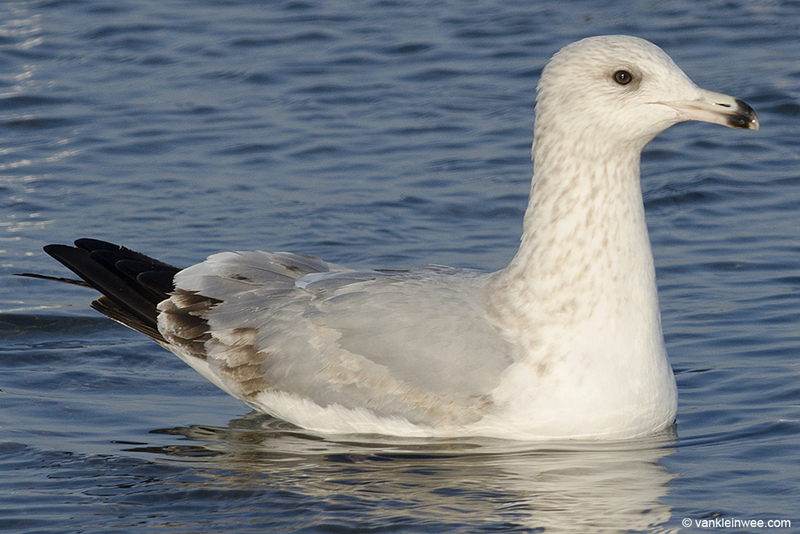 One of these features is the presence of a dark spot on one or more tertials in sub-adults, typically gulls that are one cycle away from obtaining full adult plumage. The size of these tertial spots varies from small dots with faded edges to large, sharp-edged spots (sometimes referred to as ‘ink spots’). Because the tertials are hidden in flight, they are best observed in resting birds. 14 February 2014. Lake County Fairground, Libertyville, Illinois, USA. 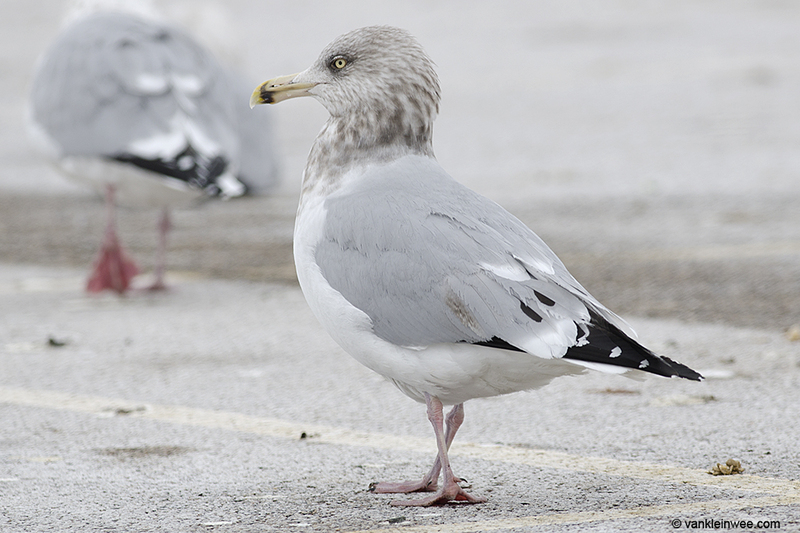 4th-calendar year type American Herring Gull with large tertial spots. Although this feature is typical for sub-adults in certain species, it is sometimes seen in adults as well (meaning: an individual in full adult plumage without any sub-adult markings other than the dark tertial spots). 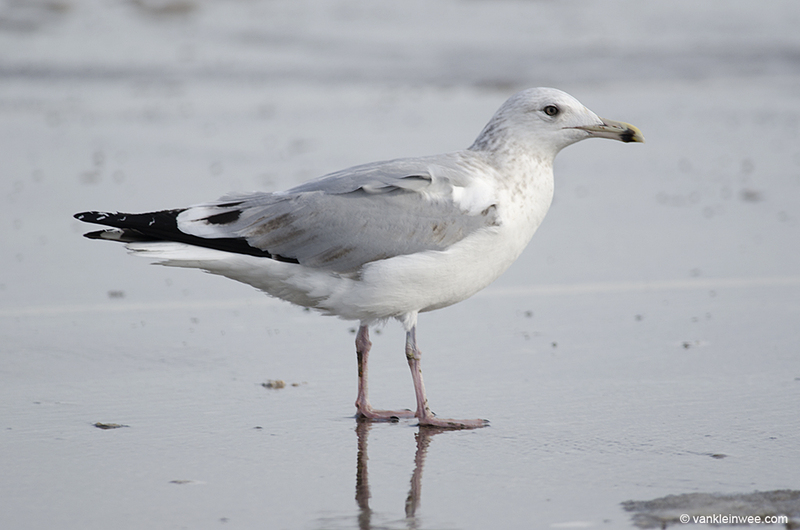 However, because we don’t see these features in adults of a known age and older than 3 years (small gulls) or 5 years (large gulls), we usually consider these to be young adults that are in their first year in which they have obtained their adult plumage. 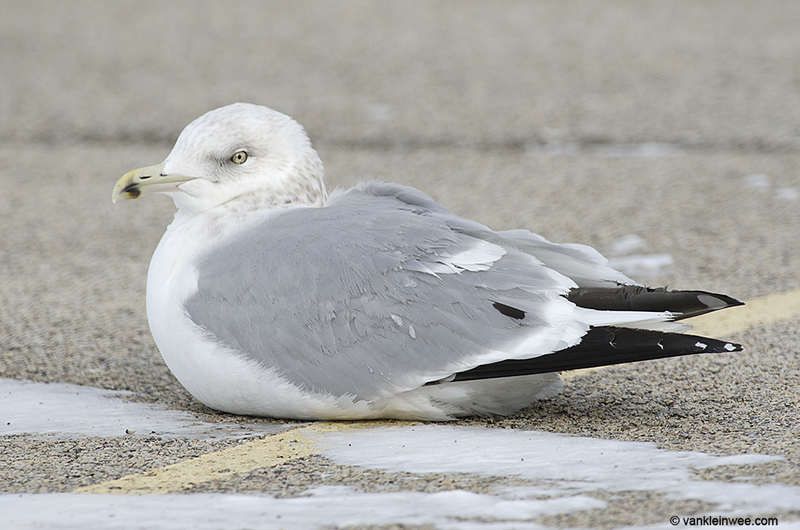 When gull watching in the area around Chicago, USA, in February 2014, I was surprised to see how common the presence of dark tertial spots was in sub-adult American Herring Gull Larus smithsonianus. 14 February 2014. Lake County Fairground, Libertyville, Illinois, USA. 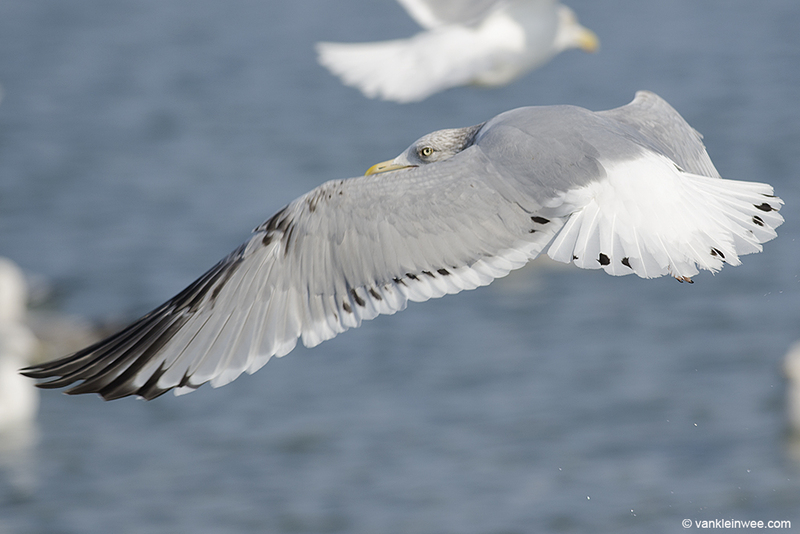 Adult type American Herring Gull (but sub-adult cannot be ruled out without seeing a spread wing), with a large tertial spot. 14 February 2014. Lake County Fairground, Libertyville, Illinois, USA. 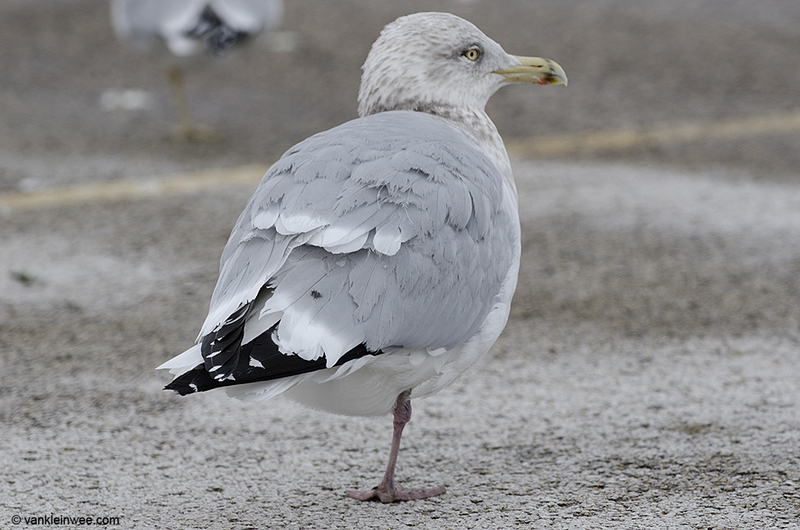 Sub-adult type American Herring Gull (based on the amount of head streaking and black mark on the bill), with a small tertial spot on the right side only. 14 February 2014. Lake County Fairground, Libertyville, Illinois, USA. 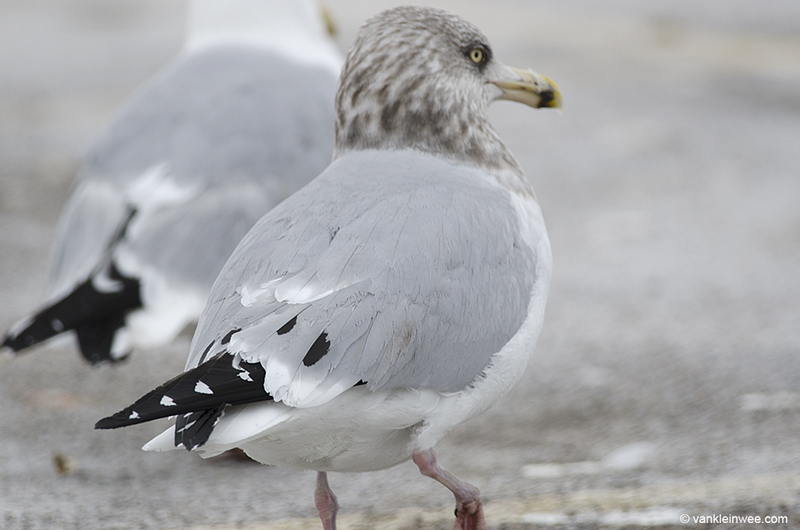 Sub-adult type American Herring Gull (based on the amount of head streaking and black mark on the bill), with a large tertial spot. 16 February 2014, BP Whiting refinery, Indiana, USA. 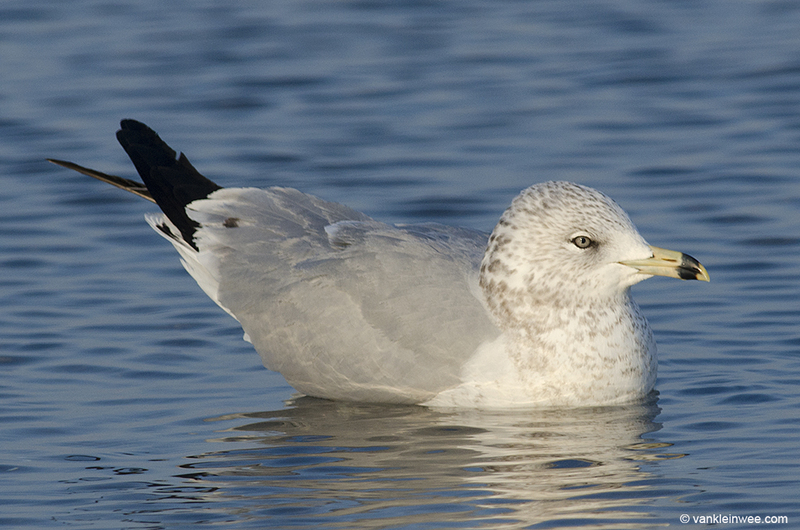 4th-calendar year type American Herring Gull with large tertial spots. 18 February 2014. Lake County Fairground, Libertyville, Illinois, USA. 4th-calendar year type American Herring Gull with a large tertial spot. 18 February 2014. Lake County Fairground, Libertyville, Illinois, USA. 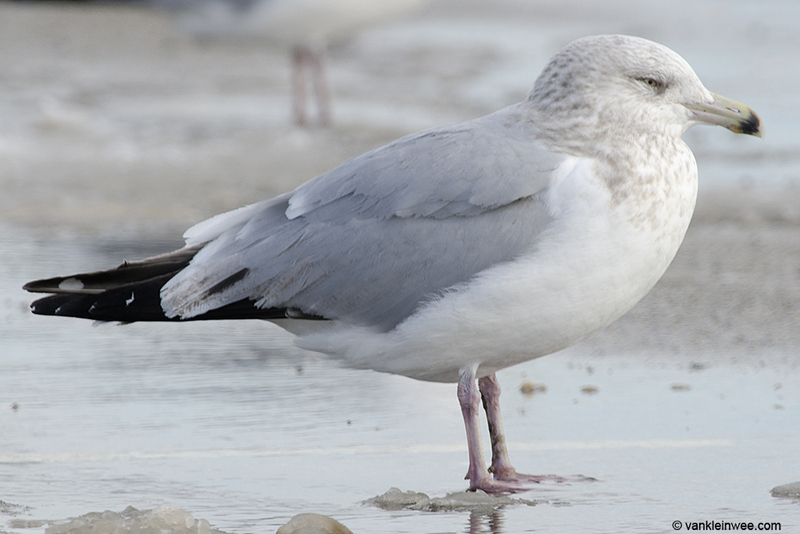 4th-calendar year type American Herring Gull with large tertial spots. 13 February 2014, BP Whiting refinery, Indiana, USA. 3rd-calendar year American Herring Gul with dark tertial spots. 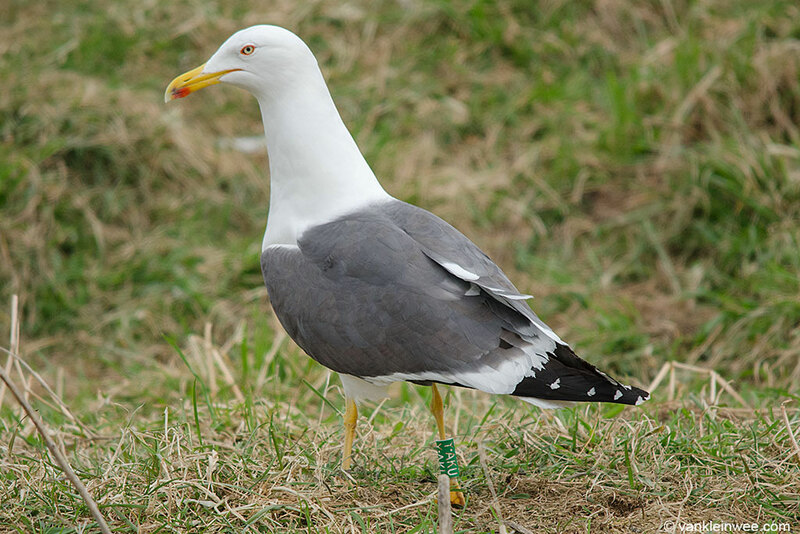 Tertial spots are very rare in European Herring Gull Larus argentatus, and only sometimes occur in 4th-calendar year birds and hardly ever in adults. Personally I have only came across a few examples. The dark greater primary coverts are indicative for a 4th-calendar year individual, but the adult looking primaries point more towards a 5th-calendar year bird. This also seems to apply to the wing coverts: browner on the underwing (4th-calendar year type) and only a slight hue on the upper wing (5th-calendar year type) . Noteworthy as well are the small black markings on the outer web of P5 and especially P4, as well as the staggered and sharply angled shape of the tongue on the underside of P10. The tail is completely white apart from a small black spot on the outer left feather, but this is not a good indication of age. 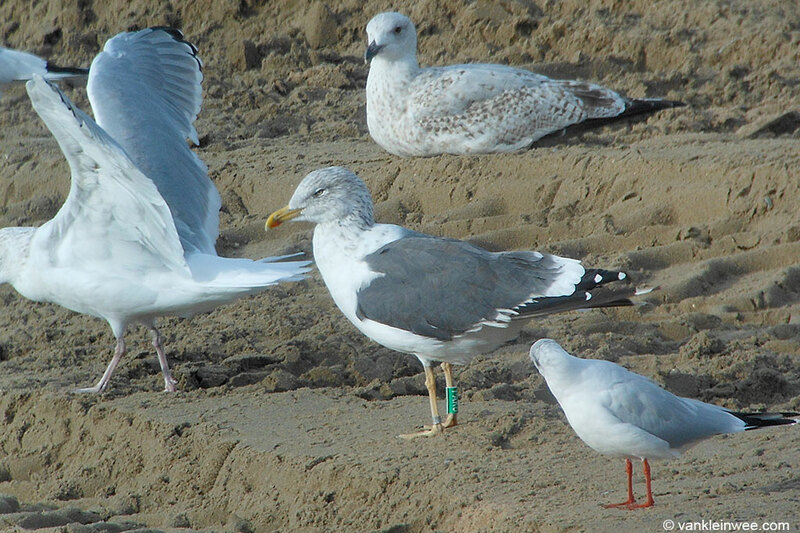 A fifth-calendar year, ringed as Green YBPS in the gull colony of IJmuiden (Forteiland), seen in June 2015 at the same location. 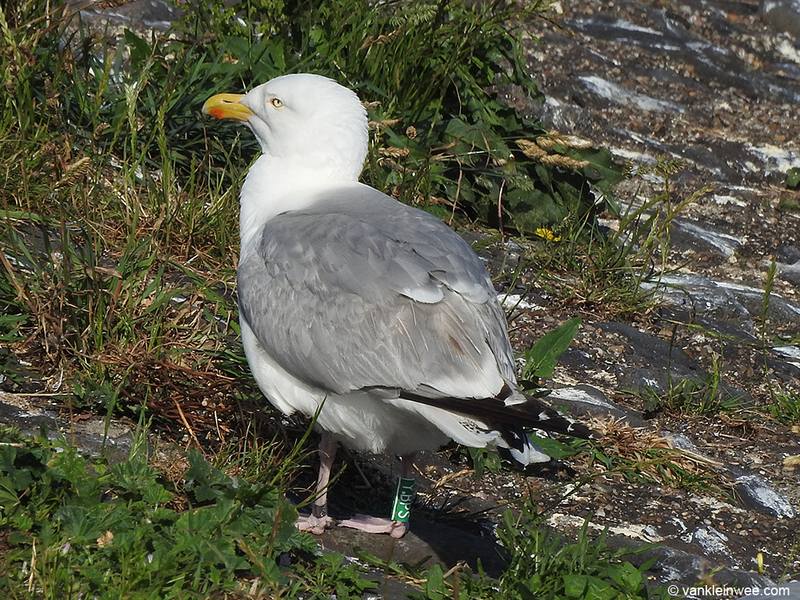 See also 5CY European Herring Gull Green YBPS with sub-adult features (incl. tertials). It was not reported if this individual also showed this tertial spot in 2015, so it is assumed that it was not present. 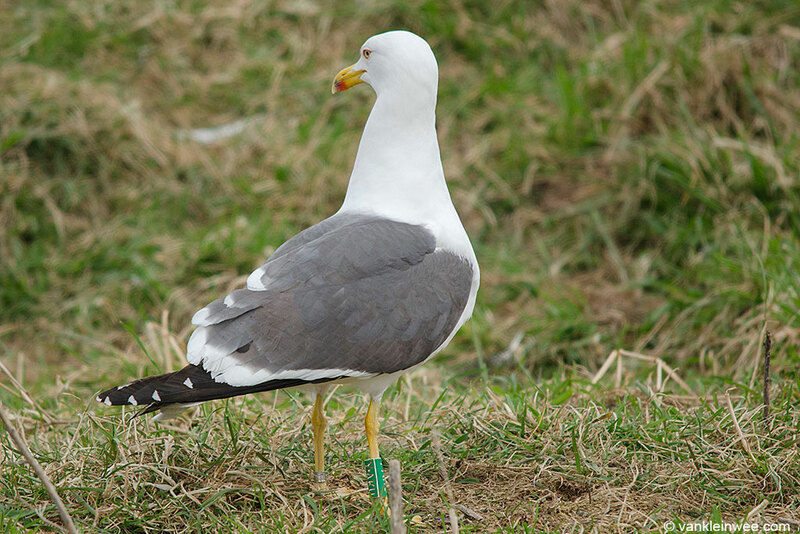 In my experience, examples of adult Lesser Black-backed Gulls showing tertial spots are very rare. Example #1, seen at Westkapelle, the Netherlands, September 2016. 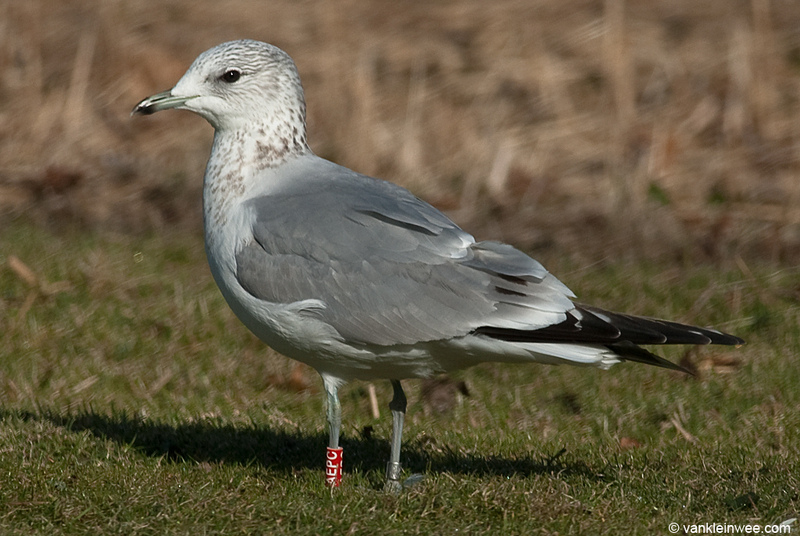 Swedish ringed individual SVS 8074511 proves that this feature is certainly not restricted to young adults because at the time we observed it it was in its 26th calendar year. Photo by Mars Muusse. 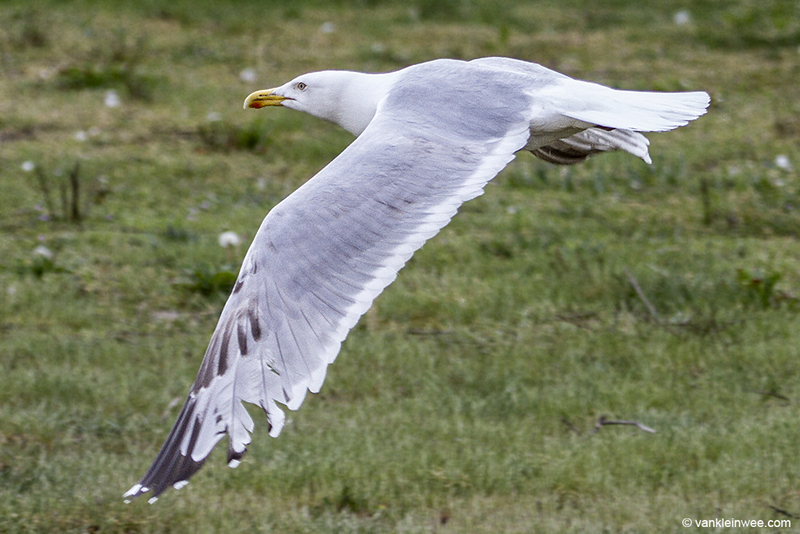 More images can be seen on gull-research.org. Example #2, seen in the gull colony of IJmuiden Forteiland, the Netherlands, April 2018. 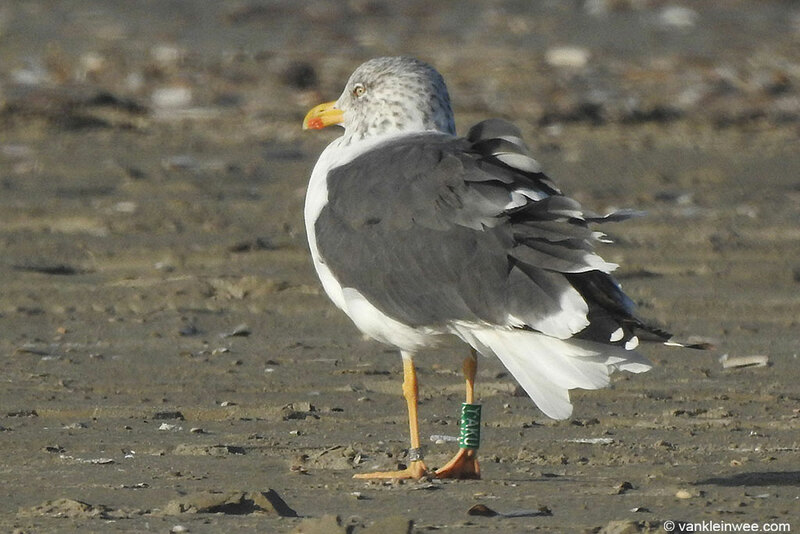 The gull in question is Green YAKU, ringed as an adult in the colony in 2009, making it older than 13 calendar years in 2018. I observed YAKU again in July 2018. By then, the greater coverts were very worn leaving much of the tertials exposed and making the spot(s) even more visible. It is the first time that I have observed tertial spots in YAKU. During previous observations dating back to 2010 I never saw this characteristic in this bird. Interestingly, this means that it can suddenly occur in adults of a relatively old age as well. Above: YAKU, October 2015, IJmuiden beach, the Netherlands. Above: YAKU, Katwijk aan Zee beach, October 2013. 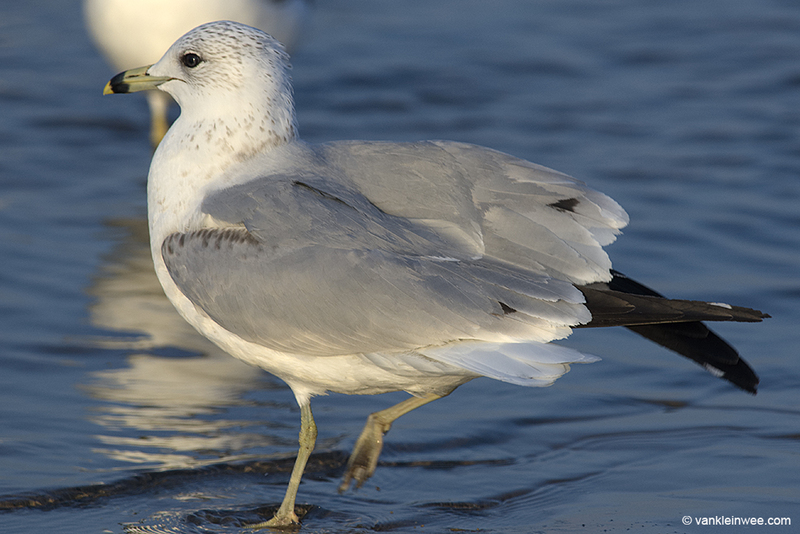 Tertial spots are a common feature in 3rd-calendar year Ring-billed Gulls Larus delawarensis and its European counterpart Common Gull Larus canus. 13 February 2014, BP Whiting refinery, Indiana, USA. Third-calendar year Ring-billed Gull with tertial spot. 17 February 2013, Utrecht, the Netherlands. 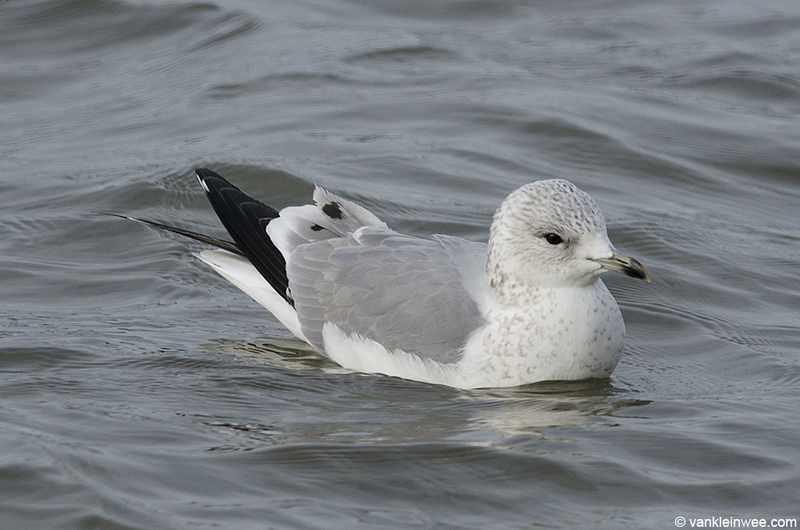 Third-calendar year Common Gull with tertial spots. 13 February 2014, BP Whiting refinery, Indiana, USA. 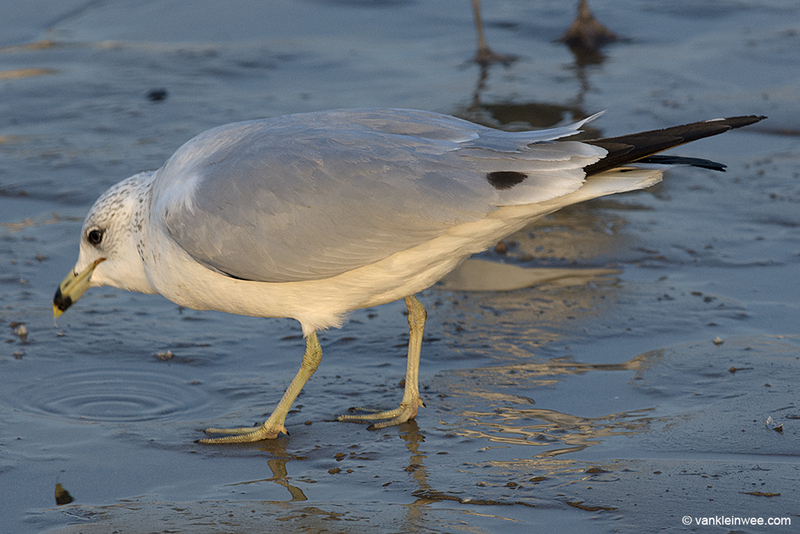 Third-calendar year Ring-billed Gull with tertial spots. 25 February 2012, Amsterdam, the Netherlands. Third-calendar year Common Gull with tertial spots. Tertial spots in Black-headed Gulls Chroicocephalus ridibundus are not uncommon but still pretty rare, especially in adults. 3 December 2010, Zoetermeer, the Netherlands. 2nd-calendar year Black-headed Gull with tertial spots. 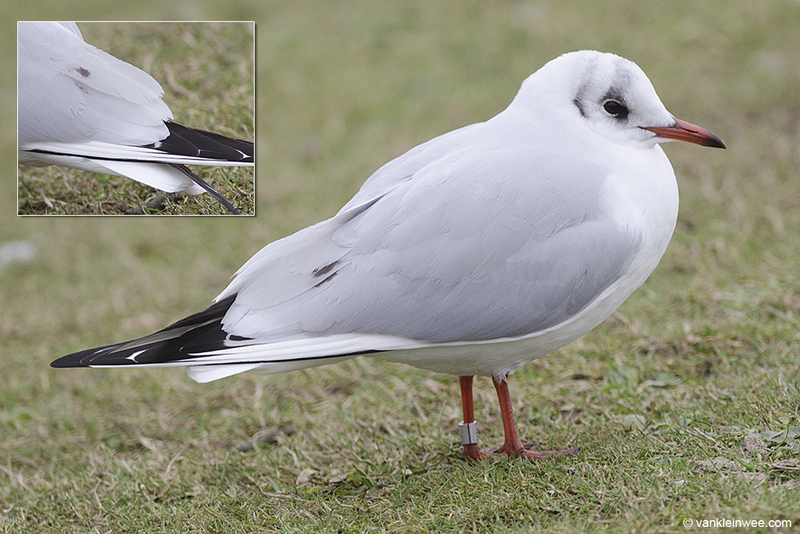 Out of the 266 Black-headed gulls caught and ringed that day, 2 individuals showed these types of markings. March 2014, Zoetermeer, the Netherlands. 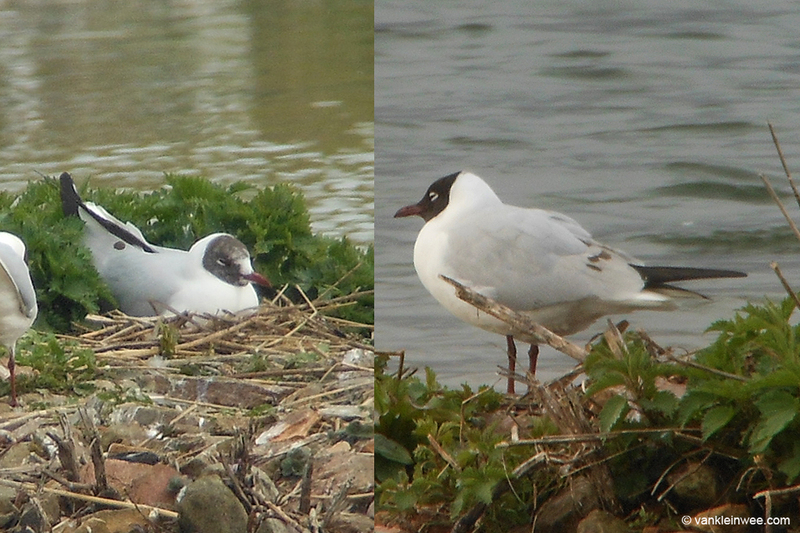 A 3rd-calendar year type (left) and adult Black-headed Gull with tertial spots. 14 February 2015, Leiden, the Netherlands. 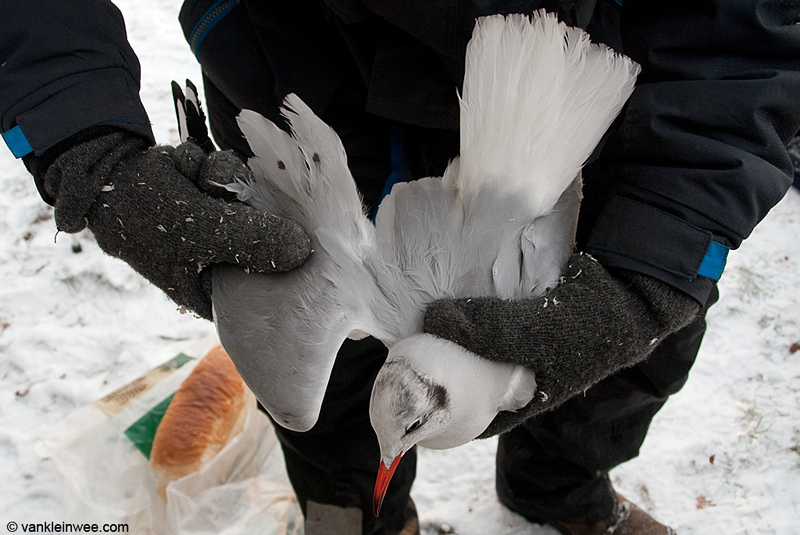 Black-headed Gull, ringed 8 February 2015 in Leiden, the Netherlands as Arnhem 3.659.665 and aged as older than 3rd calendar year. 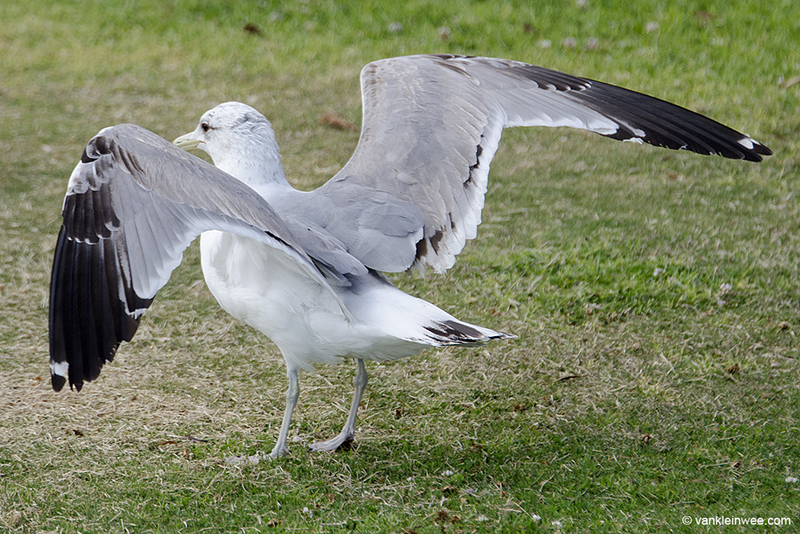 Some examples of sub-adult California Gulls Larus californicus. 8 April 2013, Seaport Village, San Diego, California, USA. 4th-calendar year type California Gull with tertial spot. 16 April 2014, Seaport Village, San Diego, California, USA. 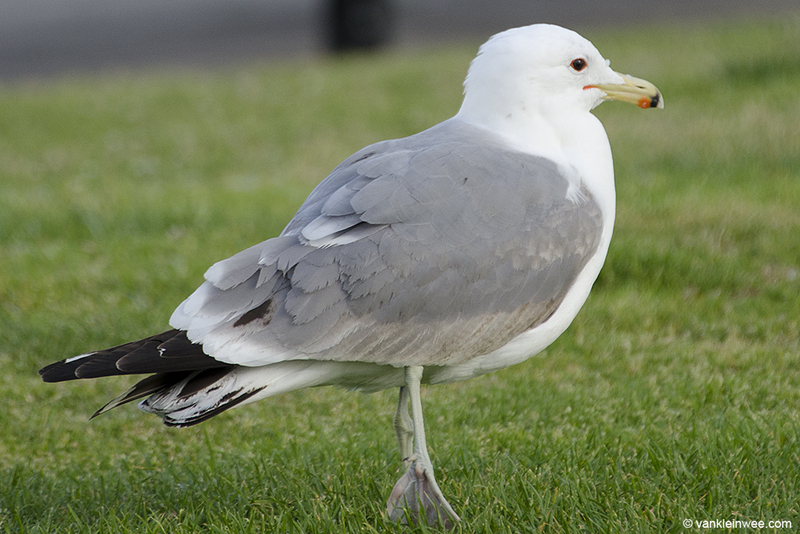 4th-calendar year type California Gull with tertial spots. If you are aware of examples in other species (especially European), I would love to see them. I’ll look for these spots in the future. I think that I may have seen gulls with them before, but at the time, I probably just assumed that it was a stain, or a flaw in the feather, or something that was showing through from underneath due to damage. 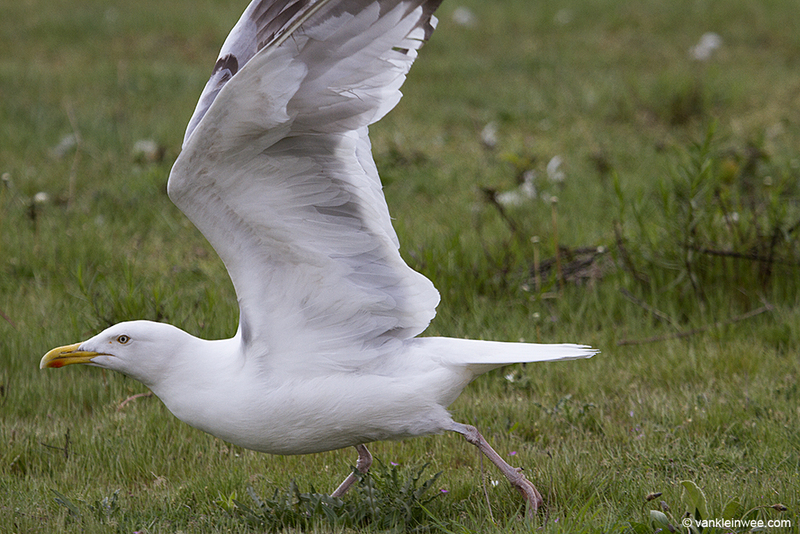 Because you do get quite a lot of scraggy looking gulls. By the way, I found a new website that you might like. It hasn’t been going for that long, but it looks like it might be interesting (even if it does use the ‘s-word’!). 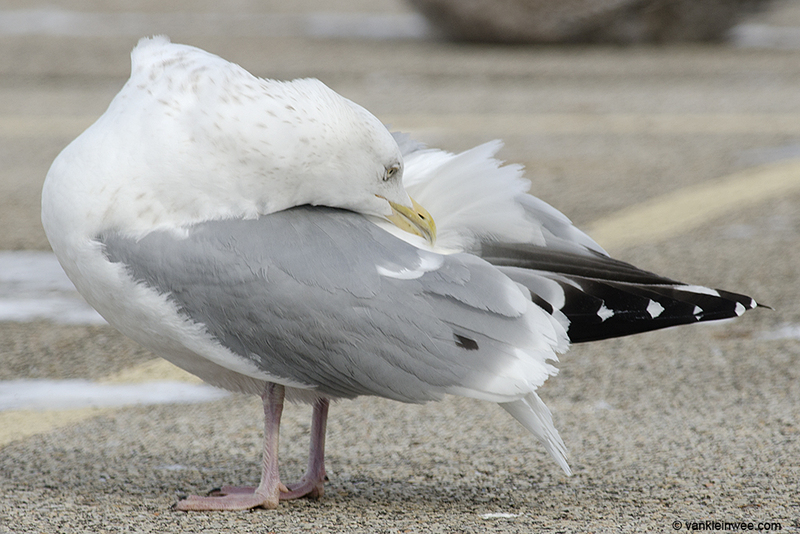 Sometimes I think that gulls need all the help that they can get. 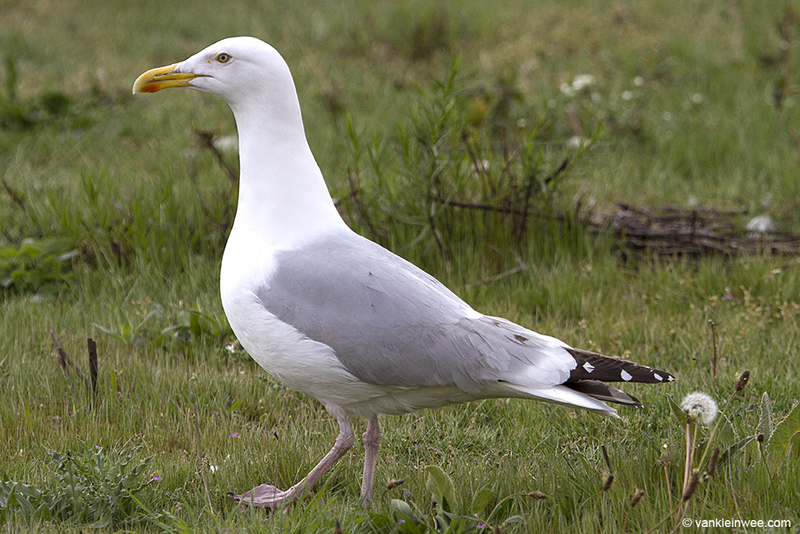 So much scaremongering and outright hatred towards them in the media – all that nonsense about how gulls are getting worse (more violent, less respectful of humans, etc.) every year and how they’re now potential muggers and killers… ‘thin end of the wedge, something must be done now!’ hysterical crap. Well in my country, anyway. It gets worse when the breeding season comes around and we get to hear about people who are ‘prisoners in their own homes’ because a mother gull swooped low at them a few times and exaggerated stories about how a gull tried to take someone’s eyes out, or how someone’s dog was ‘almost killed’ (i.e. a gull chased it!). I’m sure that some people would be literally scared for their lives now if they saw a pair of gulls building a nest on their rooftop. Probably puts ideas into the heads of the inbreds with air rifles too. It’s a terrible situation for the gulls. Thanks for that example Peter. It’s always good to see this in a ringed individual. Do you know if this is a regular feature of its plumage or if it was just a one-off? Dank je, Frank! Heel interessant. Top Frank! Daar kende ik nog geen voorbeelden van. 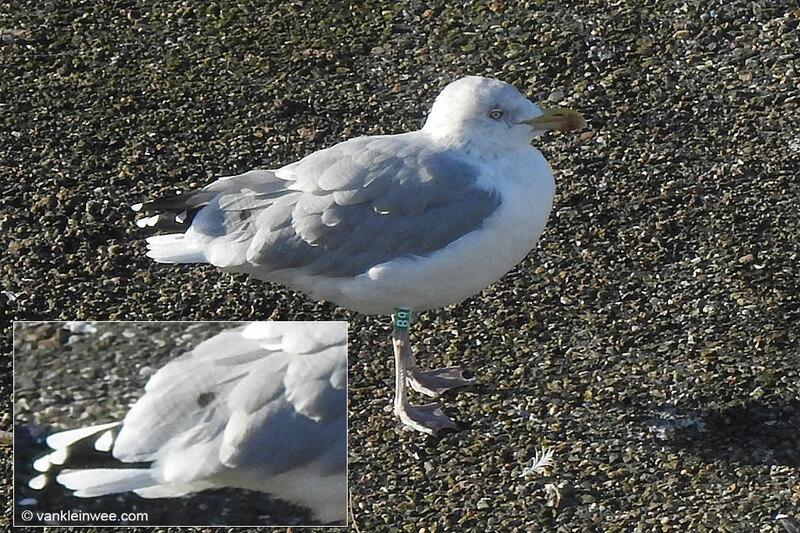 I have just come across this interesting discussion while looking for something else, unfortunately a long time after it commenced, but I’d like to offer a comment on the photos Peter Adriaens linked of a colour-ringed argenteus that appears to have ‘ink-spots’ on the tertials. I believe these ‘spots’ are actually created by shadow from overlaying feathers and are not real. If you look at the close-up helpfully provided by Peter you can see that not only are the spots not true black – they are exactly the same tone as the obvious area of shadow below the rear scapulars – but in the case of the small neat spot on the tertial it extends continuously from the tertial onto the tip of the innermost greater covert. In fact, the shape of the inner web-tip of the innermost greater covert can be just discerned running through the spot. All the shadows correspond in indicating a low position of the sun. Hi Killian, thanks for commenting. I have checked my other photos of this bird and it appears you are correct: it is shadow! Hi Peter, it is good to receive such a quick response from you, especially since this discussion has been dormant for a while…I have only just discovered “gulls to the horizon”, I can see lots of interesting stuff here!